These four simple ingredients can add so much flavor and depth to any meal. It is especially delicious for bean dishes, as beans are naturally low in fat and high in fiber. The alkaline combination of coconut and avocado will add nutritious fats (omega fatty acids) that will nourish inside (think: brain) and outside (think: skin and hair). 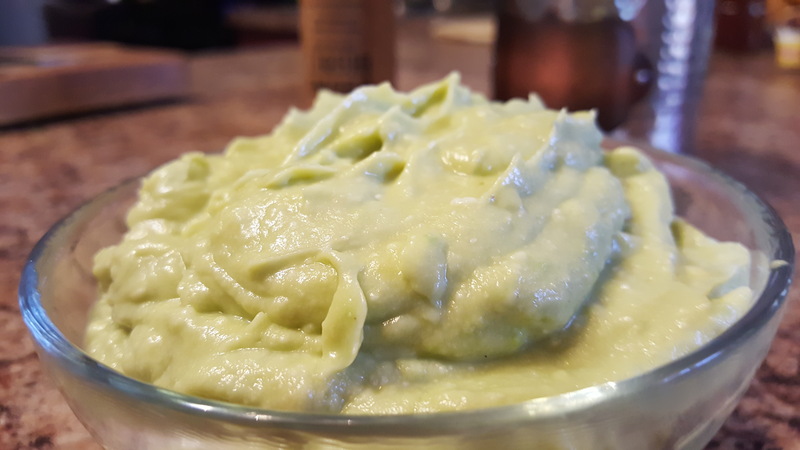 Blend coconut cream, avocado, lime juice and smoked salt until smooth consistency is reached. In the Cooking Alchemy Kitchen, we made black bean lettuce boats for breakfast, added the smoked coconut-avocado lime cream and garnished with black olives and green onions. In a small bowl, mix all spices and set aside. Rinse lettuce leaves and strain. Add olive oil to a warm skillet, add garlic, onions and peppers and sauté. Add beans and tomatoes, sprinkle spices and stir. Add salt to taste. Lay out lettuce leaves and fill with bean mixture. Evenly spread one tablespoon of coconut avocado lime cream for each lettuce boat. Garnish with sliced black olives and green onions. Enjoy!